In the showroom they view new tile collections –the convex Diamantino, the hexagonal Clinker, the crackled Micromosaic. But Strozyk is glad to also see some ceramics the workshop produced in the past, a symbol of their deep roots. “They still work with traditional techniques but they now have very modern visual language,” she says. They work out a plan for the tiles they will make. The colour will be dripped on a base, and through a chemical reaction, the glaze itself will create the pattern. 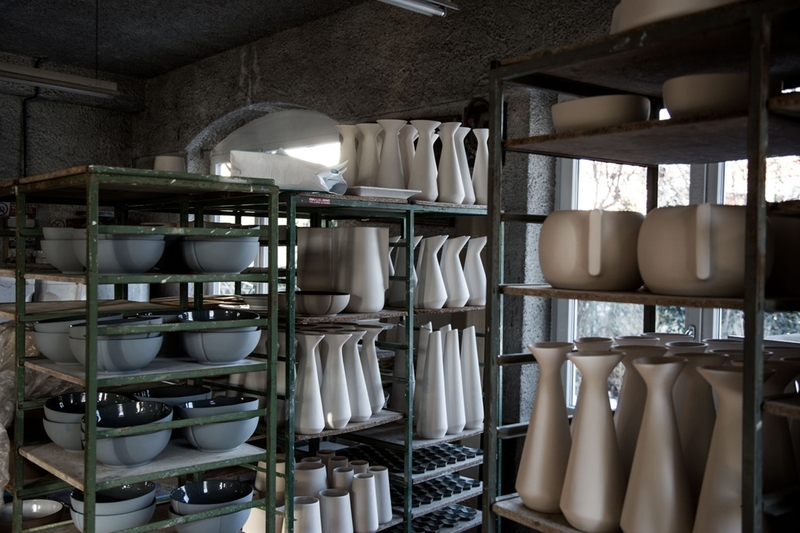 “BottegaNove’s work is connected to plants and nature,” says Strozyk, “so I like the idea of having these very organic, natural growth patterns.” Pegoraro is also delighted: the glazing technique they will use is similar to the one she used on the tables he so admired. Elisa Strozyk is a German designer who has won acclaim for her wooden textiles, a process she developed in which thin triangles of wood are attached to a textile base. Other products include a line of tables and mirrors that feature a unique glazing technique. Her awards include Elle Deco’s Textile Designer of the Year and a Salone Satellite award, and she participates in exhibitions around the world. Strozyk studied textile design at Central Saint Martins in London, at KHB in Berlin and ENSAD in Paris. She produces most of her pieces by herself and she collaborates with many famous architects on a lot of interior design projects. Christian Pegoraro, a third-generation master ceramist, grew up in Nove, Italy, a town in the Veneto region known for its ceramics production. In 2015, Pegoraro founded BottegaNove to bring new vision to the traditional craft. Since then, BottegaNove has created unique lines of handmade ceramic tiles and porcelain products that infuse an ancient tradition with a fresh modernity. BottegaNove’s three-dimensional mosaic tiles are shaped in molds and glazed by hand, often using more than one colour, with or without a lustre finish. Its celebrated Plumage line of feather-shaped tiles and vases is the result of a partnership with designer Cristina Celestino.